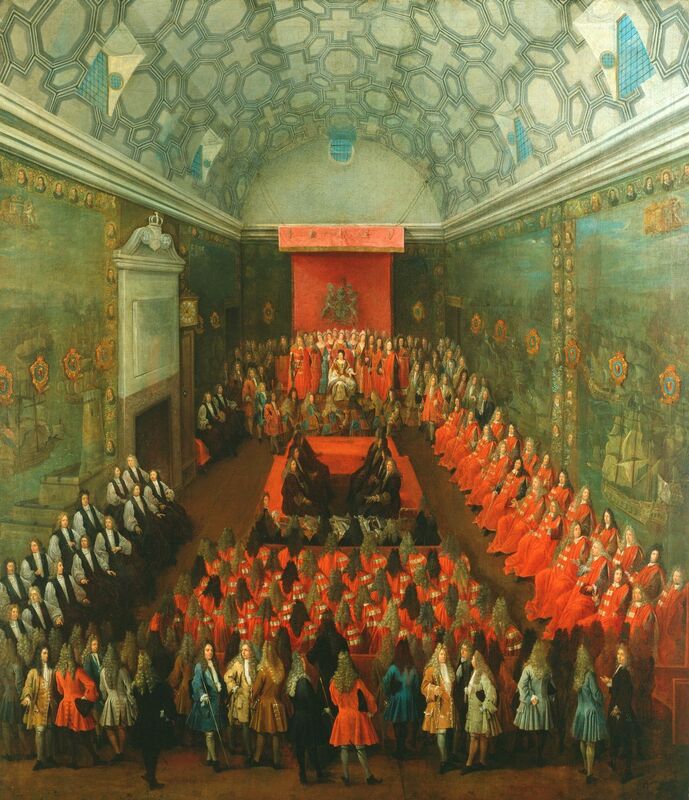 This is one of a pair of paintings, showing the two houses (the one of the House of Commons belongs to that institution), which must have been painted between Tillemans's arrival in England in 1708 and the death of Queen Anne in 1714. The old house of Lords appears with its distinctive coffering pattern in the vault (the same is used for the Chapel Royal at St James's Palace and Borromini's S. Carlo alle Quattro Fontane in Rome) and walls hung with the 'Armada Tapestries'. A long-case clock shows the time to be approaching 1.00 pm. The Queen is shown attended by her Ladies, Officers of the State, Heralds and Pages, with the House in session before her. The Lords temporal appear on the right and in the centre; those spiritual on the left *(the two Archbishops above the clock). The Lord Chief Justice and lesser legal dignitaries sit immediately in front of the wooksack; next to them a row of clerks sit at their desks. In the foreground are members of the Lower House crowd at the bar; some of them hold the white staffs indicating their position within the Royal Household.